A few privacy features need an upgrade. The best antivirus solution is one that’s as simple as possible. After all, if a user can’t navigate the app to take advantage of its features, then much of the program’s usefulness is lost. Trend Micro’s Maximum Security nails this principle with some of the easiest navigation we’ve seen yet. The default dashboard is very straightforward. There’s a large Scan circle in the middle that changes color based on the status of the PC. Clicking on the circle initiates a quick scan, while clicking the downward-facing arrow to the right of it offers the choice of quick, full, and custom scans. Trend Micro Maximum Security’s default view. Above that circle are the four basic security categories for the app: Device, Privacy, Data, and Family. 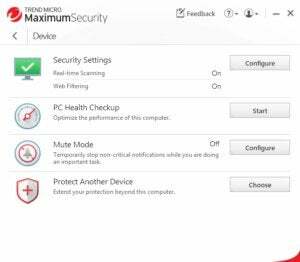 The Device tab includes the settings for Trend Micro’s real-time scanning and web filtering. There’s also a PC Health Checkup option to help optimize system performance. 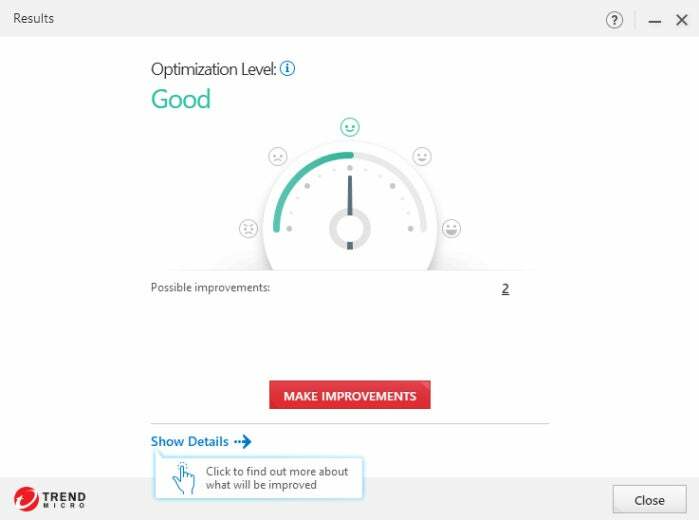 If you use the feature, the app ranks your current optimization level and lets you choose to “make improvements.” These tweaks range from fixing security vulnerabilities to reclaiming disk space. In my case, it found some saved passwords in my browser, though I can’t recall ever saving any. When I clicked on this particular finding, the program loaded the Trend Micro Password Manager—making the situation feel more like an introduction to the features of the security suite. Next up in this section of the app is Mute Mode, which is a really nice take on the typical gaming-mode feature. You activate it from the system tray by right-clicking on the Trend Micro icon. When running, Mute Mode stops “non-critical” notifications from interrupting you. There are options to disable Windows Updates, automatically terminate programs, and even turn off Mute Mode after a specific interval. That’s great for gamers who, say, want to shut down their backup program or chat app when it’s time to play, or for students who want to get serious about that history paper. The Privacy tab has features designed to keep sensitive data from leaving your PC. 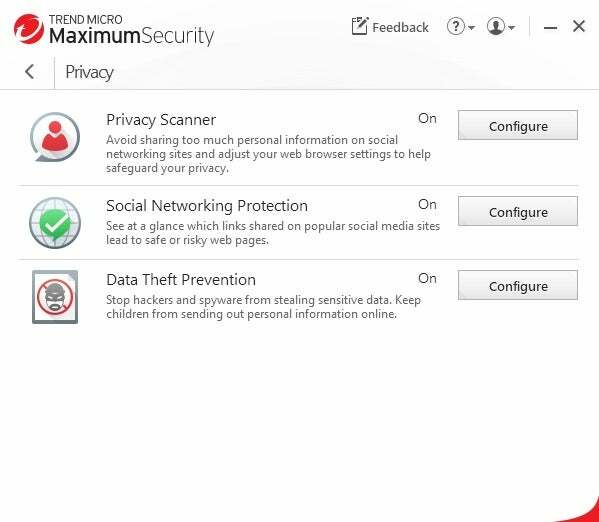 The Privacy Scanner option, which works via Trend Micro’s browser add-on, automatically scans social networks like Facebook, Twitter, and LinkedIn to optimize your privacy settings, for example. You can also scan your web browsers to make sure they are as private as possible too. In theory, scanning social networks is a great option, especially given Facebook’s always confusing privacy settings. However, its effectiveness was hit and miss in my experience. In Chrome and Firefox, the app produced a set of results that claimed I was offline. Later, I went back to Twitter on Chrome and Trend Micro displayed a privacy analysis summary within Twitter. Clicking through to see the scan’s results took me back to the browser add-on page that still claimed it couldn’t connect to the Internet. Thus, no security summary. A better approach would be to manage social networking protection features inside the Maximum Security desktop app—including logging in. That would offer a more reliable and centralized experience, similar to how Vipre Advanced Security handles its Social Watch feature. When I asked Trend Micro about my troubles, the company said this issue was probably due to some browser-specific issues. 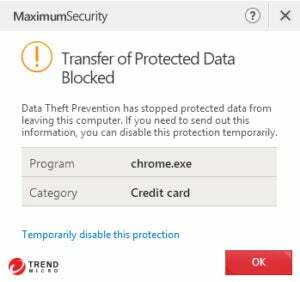 "In Chrome, the feature will not work when the user is also logged in with [a] Google account due to some possible sync issues, especially when the account is setup on multiple devices," a Trend Micro representative told me. "[In] Firefox, the recent browser update has caused an issue and the fix should be applied [during] the next Trend Micro update in July." Finally, Data Theft Prevention under the Privacy tab lets you enter specific information like a credit card number, email address, or telephone number that you want protected. If Trend Micro sees this data entered into a webpage, email, or instant message, it will warn you that the data is leaving your PC. Trend Micro says you don’t have to enter the entire number either. Just seven consecutive numbers is enough to monitor your credit card. Maximum Security’s data protection in action. In my brief tests, Maximum Security was able to stop my credit number from going out in a Gmail message, but didn’t do a thing when I pasted my numbers into Slack and a new mail message in Thunderbird. Trend Micro says the Data Theft Prevention feature doesn’t support the web sockets protocol, which is why Slack was able to send out the data. It should have worked in Thunderbird, according to Trend Micro. So perhaps my experience was specific to my PC. The Data tab is the meat of Trend Micro’s security features. Folder Shield protects specific folders against ransomware, and you can specify as many or as little folders as you’d like. Secure Erase gets rid of sensitive data, while Password Manager is a browser-based password manager for saving passwords, form filling data, and secure notes. Vault lets you encrypt sensitive data. There’s also an interesting— and perhaps controversial—feature called Cloud Storage Scanner. This feature scans Microsoft Office and PDF files stored in your cloud storage services for threats. To do this, however, the files have to be sent to Trend Micro and afterwards the company says they are securely deleted. Once the scan is done, you can get an email report letting you know the results. This feature works with OneDrive right now, while Dropbox is in beta. In my tests, the OneDrive scan failed after a few seconds. 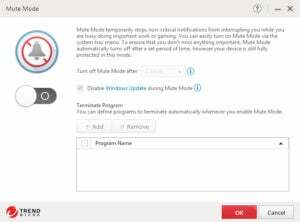 Finally, the Family tab lets you use Trend Micro’s parental controls for on-device limitations, such as restricting webpages or placing time limits on computer time. Trend Micro also has a settings section accessible via the settings cog next to the big Scan button on the main dashboard. Here you can adjust options for scanning and the PC Health checkup. There’s also an exceptions list to prevent Trend Micro from monitoring certain programs, and whitelisting websites and certain Wi-Fi networks. Returning to the dashboard, next to the settings option is a button for displaying security reports that show all threats found or blocked, results of the latest PC Health Checkup, a parental controls summary, and a security summary of your passwords. 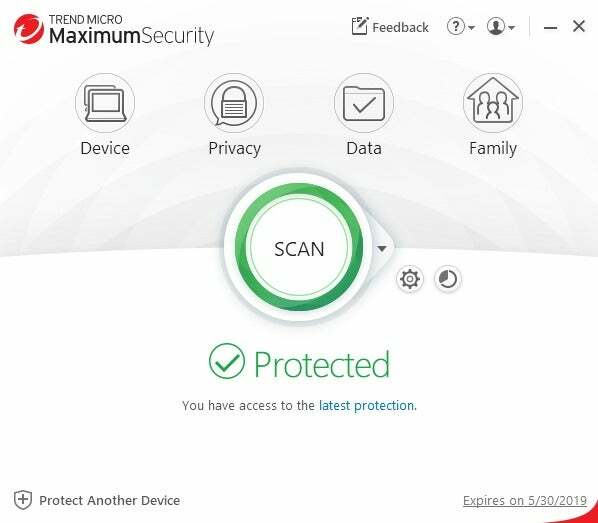 Trend Micro Maximum Security has an introductory price of $50 for five devices for a single year—the price goes up to $90 after the introductory period. If you need to cover 10 devices, the price goes up to $60 for the first year and $100 after that. Overall, these subscription prices are on par with many of the other major antivirus suites. Taking a look at AV-Test’s March and April 2018 results, Trend Micro scored 100 percent on both the zero-day and web/email threats test, as well as the widespread and prevalent malware test. AV-Comparatives had similar results. Trend Micro blocked 100 percent of 224 sample threats in the April 2018 real-world protection test with 10 false positives. Trend Micro also scored 100 percent in AV-Comparatives’ malware protection test for March 2018 with 166 false positives against more than 20,000 malware samples. 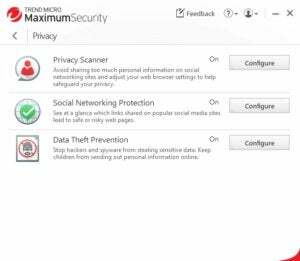 Maximum Security optimizes your PC and gives it a ranking. SE Labs also looked at Trend Micro and gave the company’s protection a AAA rating—the highest possible. For our in-house tests, performance in PCMark 8’s Work Conventional benchmark improved ever so slightly with Trend Micro installed. Without Trend Micro installed, our test PC scored an average of 2417 in Work Conventional; after the security app was installed, the average went up to 2424. In our Handbrake test, the PC chewed through a transcoding of our 3.8GB MKV file in one hour and 15 minutes. With Trend Micro installed, that time went up to one hour and 17 minutes. That’s fairly minor increase, so you’re unlikely to notice anything except maybe under the heaviest loads on a mid-range PC. Trend Micro’s pricing is great and its protection is viewed as excellent by three different testing outfits. To get that level of protection, Trend Micro employs a variety of different protection layers including regular scanning, behavioral analysis, and artificial intelligence—a common theme for security suites these days. While its protection is good for standard malware threats, the data protection feature needs a little work. It ignored activity inside some well-known desktop programs, allowing me to send out purportedly protected data. The social networking privacy features could also be more reliable. Still, the price is right for Maximum Security, and its subscriptions fall in line with what many of the other top security firms are charging. Strongly in its favor is how simple its interface is. The app itself is very easy to understand and navigate. It also didn’t bother me with a lot of notifications and updates, which is always a plus. Security suites work best when they only bother you for, you know, actual problems. 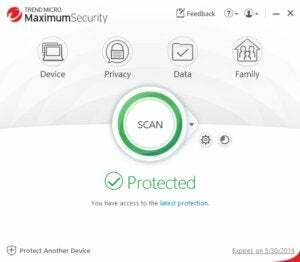 Overall, Trend Micro Maximum Security is solid security software, and well-worth the money even if a few of the extra features could use some further polishing. UPDATE: This review was updated on June 28, 2018 at 7:47 AM Pacific with comment from Trend Micro.